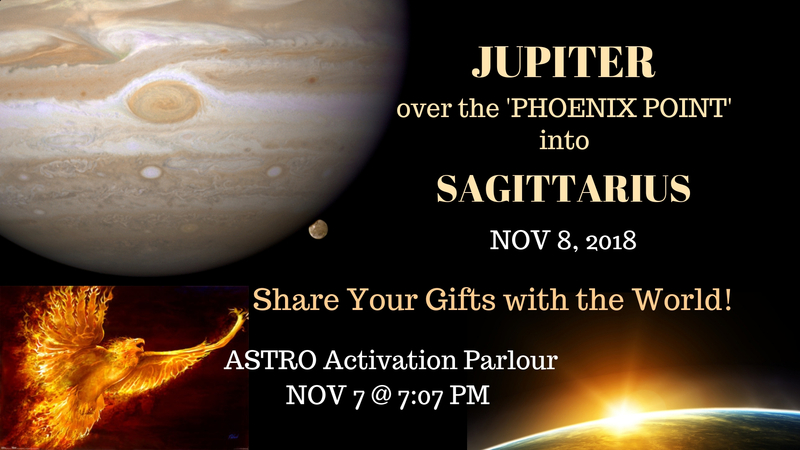 JUPITER over the ‘Phoenix Point’ into SAG (Nov 8, 2018): Find Your Heart-Truth, and Share Your Gifts with the World! After a 13-months ‘deep dive Underworld Journey’ in SCORPIO (since Oct 10, 2017), JUPITER crosses over the ‘Phoenix Point’ (YESSS!) and rises in SAG (its own ruled Zodiac sign) on NOV 8, 2018! A lifting, shifting, elevating, liberating energy! It comes every 12 years only! Thursday when the shift happens is the JUPITERday of the week, as in: Thor’s Day, Jueves, Jeudi, and the Germans call it Donnerstag = Day of Thunder, reminiscent of Zeus’s thunder bolt perhaps? 8 has long been regarded as the luckiest number in Chinese culture. With pronunciation of ‘Ba’ in Chinese, # 8 sounds similar to the word ‘Fa’, which means fortune, prosperity and success. How about reviewing JUPITER’s Journey in SCORPIO at this transition phase? Like on the last days in a country we’ve traveled in for a while – you know that bittersweet feeling of farewell, closure, and gratitude for the gifts and for… the adventure? On the ‘other side’ we can SEE the process, and share the story of it with in-sight and wisdom! ….for having offered these last 13 months extraordinary (not necessarily ‘comfortable’ or ‘happy’ yet important) growth opportunities for a deepening and expansion of awareness of what’s otherwise ‘under the radar’, taboo, in the dark, hidden, covered, repressed or concealed, and supporting transformation and empowerment for the better. Whether you’re part of a ‘SCO Archetype Mini Generation’ (born under PLUTO, NEPTUNE, URANUS, CHIRON, or SATURN in SCO, or born with SUN, MOON, AC, and personal Planets (MERCURY, VENUS, MARS), and esp. JUPITER in SCO – your last year would have been VERY scorpionic. Here are the ‘Scorpio Archetype Mini Generations’. The time periods of these slow moving Planets in SCORPIO when the ‘Archetype Generations’ were born also had a certain historic Zeitgeist signature. Maybe you remember some of them, how they changed you, as you were going through a deep psychological process, esp. related to the area in your life related to the SCORPIO House in your chart. The area of life related to SCORPIO in your chart (House, Planets) has been ‘magnified’ over the last year, and more SPACE created around it that allows for growth from the depth. See how you’ve been alchemized over the last year, i.o.w., where perhaps disowned, (in the) dark,’shadow’ed’ parts of you have been integrated and transformed – in the name of (perhaps only now or later seen) Change for the Better. 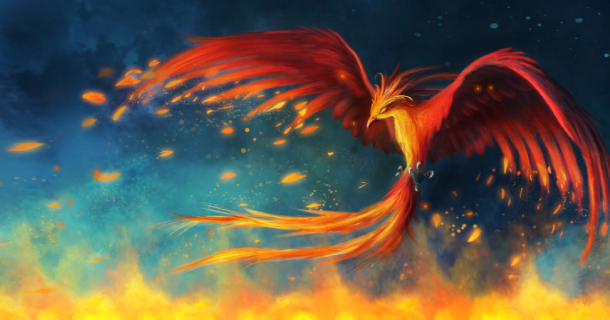 PHOENIX Rising equals also: Kundalini Rising. On Sunday evening I was at a wonderful Cacao Ceremony / Sound Journey / Kundalini Dance Fusion. Perfectly timed for the SCO into SAG Phoenix week! I love this Yin-Yang Dragons-into-Phoenix image on top of the Gemini painting by Johfra Bosschart. Evolved GEMINI is the Alchemist – bridging and unifying polarities and dualities…. To SEE is to be FREE! Time to tell the stories – under JUPITER in SAG. JUPITER loves story telling and reviewing things from an ‘Eagle perspective’. Aligning with the Archetype is where it’s at – keeps us in the flow of the universe-all unfolding. What’s JUPITER in its Home of SAGITTARIUS about? JUPITER rules SAGITTARIUS, and is very ‘happy’ in that energy – a natural match. 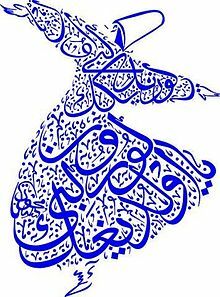 Benevolent Overseer, Happy & Jolly, Generous Giving & Living, Forever Young and Always Free Wheeling Nomad and World Traveler, Pilgrim, Gypsy, Visionary, Priest/ess, Philosopher-Teacher, Inspiring and Wise Story Teller, Truth Sayer, Wanderer and Wonder-er. Righteous Preacher, Gambler, too-good-to-be-true Salesman / Politician, Manipulation of Truth to fit one’s Belief and Agenda, ‘My Way IS the High Way!’, Listen to me! Indoctrination and Inquisition, Wastefulness a la ‘more is better’ (yet never satisfying). 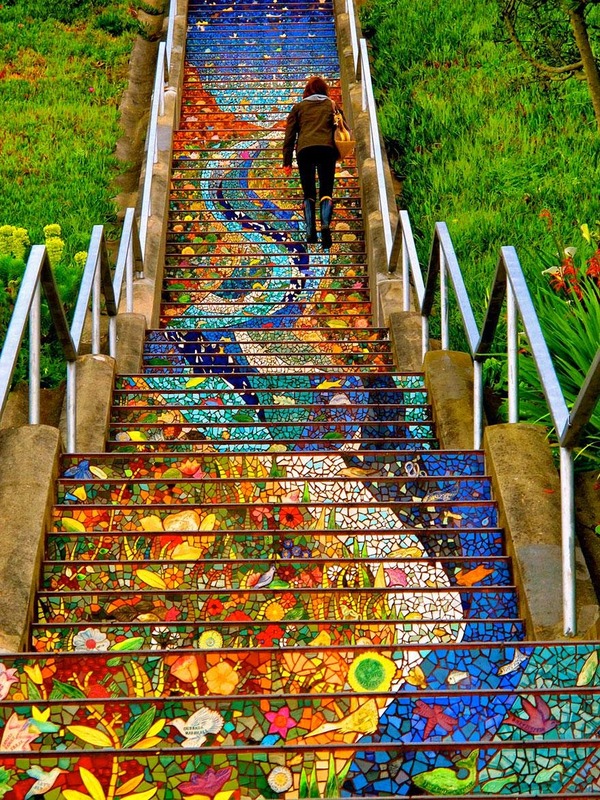 Tiled Staircase in San Francisco – wow! * The Truth shall set us Free! What’s True for YOU – perhaps esp. after the SCO year? Stand in Your Truth and speak it freely! * Give yourself room to grow, and outgrow the old and told! * Gain Perspective – Understanding – Vision – and a new / clearer / more meaningful and inspiring Direction. Journaling, Walks in the Woods, Fireplace Talks with good Friends, or with your Astrologer 🙂 – all good support / reflection support to bring out your Inner Wisdom. * Where are you going? And where are you coming from? Give yourself permission to be moved by your Heart, and trust the Journey! * Upward-onward! What can you say truly YES to? Aim from the Heart and Focus on the Best! As I’m grateful I’m happy (rather than thinking conditionally: once I’m happy I shall be grateful). As I’m seeing the Journey and the Gifts I’m happy. Being the Miracle of Being Alive makes me happy and grateful. * Put your Prayers out – esp. Prayers of Gratitude and Blessings! May we all be blessed on our Journey to and with the Light! * Sharing our Gifts with the World. * Come from an Abundance Consciousness. 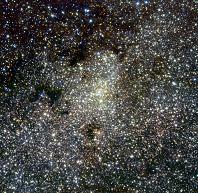 The Universe is abundant – actually infinite. And it contains what appears as scarcity while there’s so much more out there. See and seize opportunities that present themselves as you invite them. * Move forward-upward with an Attitude of Gratitude – Abundance follows! Its Opportunities and Gifts want to be activated wisely! It’ll be a VERY Sagittarian year. Let’s make the Best of it, and share its Gifts forward! And you might need (more?) Space and Freedom in those areas too (I’ve seen that a lot in clients re: relationships when JUPITER travels through their 7th House). JUPITER will activate the U.S. 12°12′ SAG Rising (representing the country’s identity) in January 2019, and start a new 12-year cycle where the above qualities are crucial for growth into a good direction and ‘greatness’. What are the ‘SAG Archetype Mini Generations’? All of us born with slow moving societal (JUPITER, CHIRON, SATURN) and transpersonal, evolutionary Planets (URANUS, NEPTUNE, PLUTO) in SAG. Uhhh, lots of us have slow moving Planets in SAG – Inner Archetypes that will be stimulated through JUPITER soon! Even though you’re young in years what is it that you deeply know, and how can you / IT be a powerful transformational inspiration for our time? JUPITER can show you where opportunities lay to fulfill your dreams and be on your Journey upward – for the greater and highest good. JUPITER’s visit amplifies your gifts and can make you even more inspired to experiment with unheard-of avenues. The Wisdom of your Stories heals. This year shows you even more what a gift this is – which instantly spreads when shared. Where you experienced challenges and obstacles on your path – even though as teachings and important purposes – JUPITER shows you the bigger picture of your Journey, how being in your Heart helps you (rather than overcome) outgrow limitations, and what would make life more rewarding. SATURN activated SAG the last time Oct 2012 – Dec 2014 and June – Sept 2015. What presented itself then as challenges and evoked fears will be now activated by JUPITER to show opportunities and gifts – if you come from the Heart and trust the Journey. JUPITER helps you open your Heart to being in your undoubted Truth. …you’re into abundance, gifts, and opportunities anyway, just watch for ‘too much of a good thing’ – who wants to overwhelm (incl. oneself) – esp. as NEPTUNE in PI is also in the picture? You have your JUPITER Return this year, and new JUPITER growth cycle starts for you. Your optimism and inspiration helps you see opportunities. Your Gifts keep on Giving – in an even more rewarding multiple-win way! Set your Heart on Fire! What does your intuition say about your Journey with JUPITER this year? … in an intimate group (with online participation option, your choice afternoon or evening, RSVP) – where we bring clarity, vision and perspective to these themes as we co-explore directly all participants’ charts and life experiences. Walk away with new inspiration to consciously, knowingly invite JUPITER in SAG into your Journey over the next year! JUPITER’s entry into SAG will be at 4:44(!) am PST on NOV 8. Wow, the newly waxing MOON in late SCO – less than a day after the SCO New Moon – ‘delivers’ JUPITER over the ‘Phoenix Point’ into SAG! and Rising upward-onward, from the inclusive, loving Heart that sees the bigger picture! After a New Moon is in general a good time for new beginnings, and MOON / JUPITER is a boost to feel relieved, uplifted, and to perhaps already feel deeply (SCO) and clearly (SAG) what’s most most important (JUPITER) now and why (SAG)! ….as JUPITER – ruling Planet of SAG – which is the Rising Sign (12°12′) of the U.S.! – moves into SAG just 2 days later – and over the U.S. AC in January 2019 to start a new 12-year cycle of growth and – freedom! Holding our Neighbour down South in the Light. May the Country come back to the Best of what its Spirit and Values represent! CHIRON retro, freshly back in late PISCES on the cusp with the Spring Equinox ‘Emergence Point’ where ‘it’s all coming together as ONE, where everything affects and influences and is connected with everything – and where Connectedness and Unity Consciousness heals – new Life emerges from there. The Lunar North Node is barely still in LEO – crossing over the ‘Creativity Point’ into CANCER on Nov 16 where we (rather than ‘watching the show of others who seem to run the show) are called to be creative, playful, be seen and loved, loving and compassionately caring for who and what matters most – which generates good energy. Astro Nodal Parlour on Nov 14. 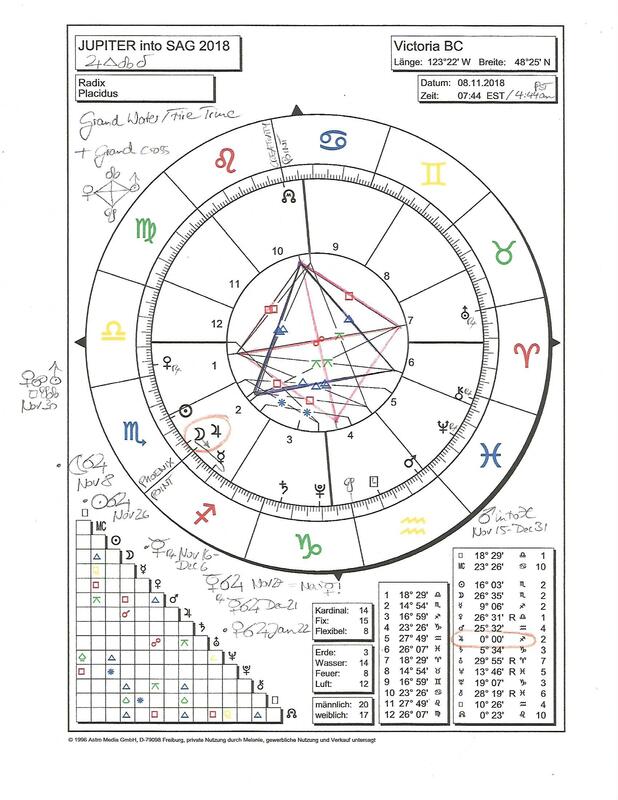 A Trine aspect has a JUPITER character, and here we have 3 Trines aligned in a stable triangle – with JUPITER freshly entering its own sign SAG involved – Big WOW! SO extra JUPITERian! A Grand Trine is a Gift that’s sitting there, and needs to be unwrapped to be appreciated. Water-Fire transition is miraculous, creative fun, magical! Lots of people I know have spoken of amazing synchronicities, miracles, and magic showing up for them, and I’ve seen it too! It ‘only’ takes for us to be in an inner receptive and connective space (CHIRON in PI) that makes us available for the magic that’s always there to show up. And there’ll be a lot to SEE with JUPITER in SAG. SAG rules the physical eyes, the Third Eye, and our vision and wisdom. And also the thighs – our biggest muscles that carry us forward as we walk on our – path, literally and symbolically. What is it that we need to keep an eye on – now as we know, and see the bigger picture? There’s always more to explore – in 2019 – says JUPITER in SAG! NOV 16 – 19 – Ride the Waves! MARS freshly in PISCES (from Nov 15 on) will square JUPITER in early SAG on Nov 19. Rather than ‘spilling energy all over the place’, let’s direct our connectedness into uplifting joy, heartfelt movement, and fun-with-a-cause! The MOON will be also in PI Nov 15 – 17, connecting with MARS on Nov 15, squaring JUPITER and meeting NEPTUNE on Nov 16 (which is also the day when VENUS goes out of retro, and MERCURY goes into retro – whoaaa!). Be fluid, ‘step into liquid’ (title of a surfer movie), and ride the Heart Waves of Love while the mind takes a back seat. On Nov 22 / 23 will be the first Full MOON with JUPITER in SAG – and the SUN aligned with JUPITER (a once-a-year connection that builds up to be exact on Nov 25)! A very mutable / flexible / moving energy post the Scorpionic and otherwise fixed holding patterns we’ve experienced. What speaks to you? What’s calling you from your Heart? Where is your Big YES? Bring your Heart Truth into the conversation, listen and learn! Connect with your Inner Fire – and fan it with the lightness of Gemini! MERCURY retro in SAG meets the SUN on this half-way point of MERCURY retro = the day of ‘New MERCURY’ a.k.a. ‘Day of Enlightening Insight’ – lighting up the Truth of Consciousness & Heart Knowing beyond-mind even more as the ‘New MERCURY’ meets JUPITER in SAG! A new way of being in the Truth and Speaking the Truth (that has no opposite) is emerging. All of January, exact JAN 14 – Overwhelm or Miracles-in-Action? JUPITER in SAG will be square NEPTUNE in PI – while MARS by then in ARIES goes into Fire Trine with JUPITER – exact Jan 26. As JUPITER moves with a good pace forward into SAG in the first months of the New Year (up to 24°21′ in April when it goes retro) it’ll go throughout January (peaking on the 14th) into mutable square with NEPTUNE ‘sitting / floating’ in mid-PISCES – a tension that requires a directed (SAG) outlet. It can show up as a sense of overwhelm with so much energy free-floating around while you want to go into a different direction (like a sailboat off-course) – of course not the best but an understandable experience under this transit. How could that be transmuted? MARS in its natural fierce ARIES mode steps into the picture too, in Fire Trine with JUPITER end of January. This can give us an ‘oomph’ to get something going that calls us – while we surrender and receive at the same time. A beautiful combo of fiery Yang and watery Yin qualities. Big Blessings and my very Best Wishes for JUPITER in SAG, for you, me, and us ALL! The SUN Crosses the ‘Phoenix Point’ from SCO to SAG: Rising – and Raising Vibrations, with the Inner Heart Light. Today Nov 21 at 7:05 pm PST, the SUN moves from SCORPIO to SAG – across the ‘Phoenix Point’. We made it through ‘THIS’, burnt a lot through and off, and rise again… from the deep intense Scorpionic ‘underwater’ realm to a Fiery, Spirited Sagittarian sense of Knowing that might sound like: “We got through it, and see the picture more clearly now!”. Yet, do we like what we see? And do we really know where we’re going from here? ‘More’ isn’t always ‘better’, and “I know better than you!”, “Our belief is superior to yours” heed karmic boomerang effects, are separative, and obstacles on the spiritual path. Now we’re literally in the landing phase of SATURN in SAG – last 4 weeks! An excellent time for a review of the teachings of the last years. MERCURY will starts its retro journey also from close to SATURN (and will meet SATURN on Nov 7). 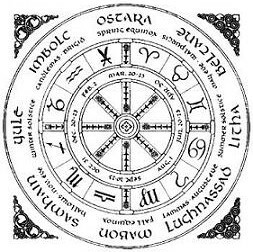 In combination with PLUTO in CAP, the Zodiac sign ruled by SATURN, deep, dense, old, historic power stuff layers built up over time, and running through societies and cultures is coming ‘up and out’ now. Just saying: Plutocracy – Greek origin, literally: power of / dominion by the wealthy. Here’s an excellent historic documentary film called Plutocracy that I found when researching. PLUTO = it gets intense as it changes. CAPRICORN = “I use” (resources and time) / shadow: Abuse and exploitation – to ‘optimize’/ get the most out of it. SAG and CAP are intertwined these days, via SATURN – which gives the ‘usual’ high-spirited SAG a heavier, weighty, shadow conscious, karmic tone – to mature and ‘ground’ the energy in integrity. What are truly the best gifts we can make to others and ourselves these days? What’s with the ‘Christmas Spirit’ – independent of materialism? What brings ‘the Return of the Light’? Indeed, where is the light in the SAG world these days? The very grounded Hermit in the landscape of the Johfra painting holds a lantern, representative of carrying our soul light that sheds a spotlight on the step ahead but doesn’t allow us to get too much ‘ahead of ourselves’. A good image for SATURN in SAG. Time to give ourselves the ‘Ring’, and commit to a Path of Heart and Cour-age. Let’s be rooted in our Hearts, and not be held back by fears, to follow our Heart! 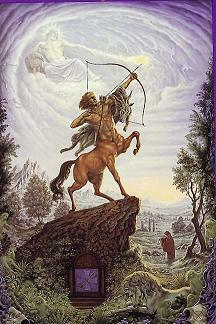 Always a good reminder that the Sagittarian Archer/ess pulls the arrow back to her / his HEART while aiming high! As we connect in Heart Consciousness we not only rise in our own vibration but raise vibrations that affect those around us, and energetically a whole ‘field’. If you’re a Sagittarian by SUN sign you would have had SATURN on your SUN sometime between 2015 and end of this year, a major maturation of Spirit (that’s ‘due’ every 29 years), and perhaps some karmic ‘graduation tests’ too, when it comes to trusting yourself, your intuition and knowing, being in your natural authority, and on your Path. In the Chakras, the SUN is astrologically related to the CROWN Chakra, and SATURN to the ROOT Chakra. I’m feeling called to offer another ROOT-to-CROWN Astrological Chakra Journey from early January on, possibly even already starting on Dec 28 – would be a beautiful alignment. With SATURN then in CAP – very rootsy! Let me know if you’re ready to come on board! No prerequisites, re: Astrology or Chakras. An open mind and heart are good assets. Here’s the FB Event for a previous journey, to give you a sense. Much Love for the Sagittarian Times ahead! May our Heart Light lead the way! For the 3rd and last time (after Dec 2016 and Apr 2017) SATURN squares CHIRON today, NOV 2..
Now, SATURN is in late SAG, the area which projects out into the Centre of the Milky Way, a.k.a. 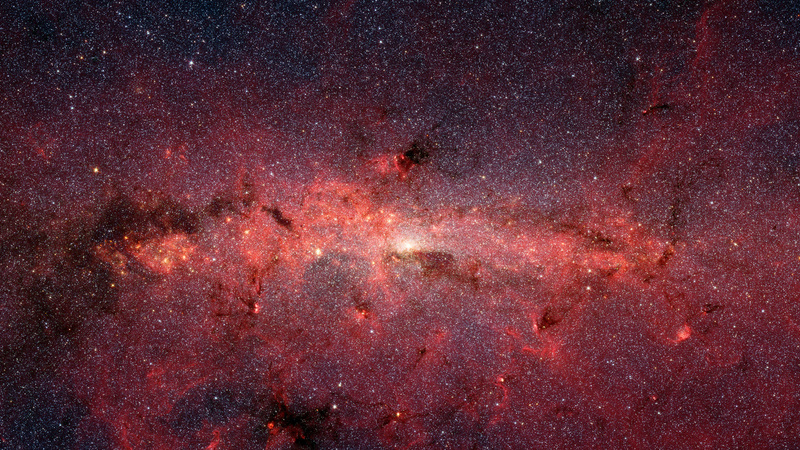 Galactic Centre – pointing us to the Ultimate Unknown and Unknowable. In the Northern Hemisphere the SUN is there on the last days before Winter Solstice. How do we know, or how can we trust the Light will return??? Since Sept 2015, SATURN in SAG has brought trials and tests, to show us how we respond to perceived road blocks. How can we be done with old stories and limiting beliefs (that ARE the road blocks)? It would be good to do a review of Before (2015 when SATURN entered SAG) & After – now in the last 7 weeks of SATURN in SAG (until Dec 19). We might have been afraid esp. recently that a ‘wrong direction’ (SAG) by (ir)responsible leaders (SATURN) can set off a trajectory on the karmic path (SATURN) that can make us all vulnerable (CHIRON in PI), to put it mildly. Yes, we know and feel it… or tune into collective fears. Speaking of the ‘pink elephant in the room’, Trump is affected by SATURN in late SAG, now (every 29 years) right on his South Node / Lunar Eclipse MOON that likes to preach, go by good-bad / right-wrong judgments, ‘shoot from the hip’, and exhaustingly (apparently more for the audience than for himself) target, or be the target. Listening and learning (GEM) would be the incentive in his chart – and life. What’s the teaching (SATURN), the ‘way out'(? ), the healing and Medicine (CHIRON) in this? Trust (one of the themes of SAG) doesn’t seem to take us far these days, under SATURN in SAG, at least not trust in people in authority, perhaps not even trust in our own choices and responses under stress? We know, the road of division, separation, righteous accusation, polarization, and arrogance, all fueled by fear (all shadow expressions of SATURN in SAG) goes nowhere (except provokes karmic repercussions). In the polarized world, the CHIRON in PI would mean, someone / some party has to surrender, or else suffers greatly. How can these old agendas, beliefs, ‘stories’, and paradigms be ‘washed out’ and released? What sets them free? What’s the High Road that dissolves Right-doing and Wrong-doing? ‘The Field’ Rumi points to? Can be ‘only’ the All-Connective Fabric of LOVE that’s beyond personal attraction, likeness, preference. The Love that has no Opposite (as Krishnamurti pointed out). An ultimate Medicine for us, in our personal suffering, and a vibration we can offer to a world in distress, and whom-it-may-concern. What’s being cleared away now, from your ‘inner basement / closet’? Where is deep transformation now possible in your Life, what does it take to go INTO it, and how do you meet the landscape you meet there? What’s the Alchemy that presents itself? What does that mean for your ‘outer’ world, above the surface? You can find out more about the Deep Dive Sessions at my FB Page Event. If you’re new to my services I welcome you to get in touch before booking, if you have preliminary questions, and to get to know each other a bit before we ‘dive in’. End of LIBRA NEW MOON opposite URANUS: Diving into the Alchemy of Life! Awakening into the always-New & Free Self. The LIBRA NEW MOON this year is only 3 days before the SUN enters SCO. We’ve been experiencing a series of New Moons at the end of a Zodiac sign, since the Total Solar Eclipse on Aug 21 – on the very last degree of LEO. The pattern continues until the end of the year. The SAG New Moon will be on Dec 17. This is the New Moon following the Super VIRGO New Moon opposite CHIRON on Sept 19 which carried a lot of complex, nervous, and overwhelming energy, and was a call for flexibility in integrity. How has your lunar month been??? Seems like more than a month has passed, since it was packed and loaded. So yeah, today Oct 19 at 12:12 pm PDT was the LI New Moon – on the cusp to SCO. 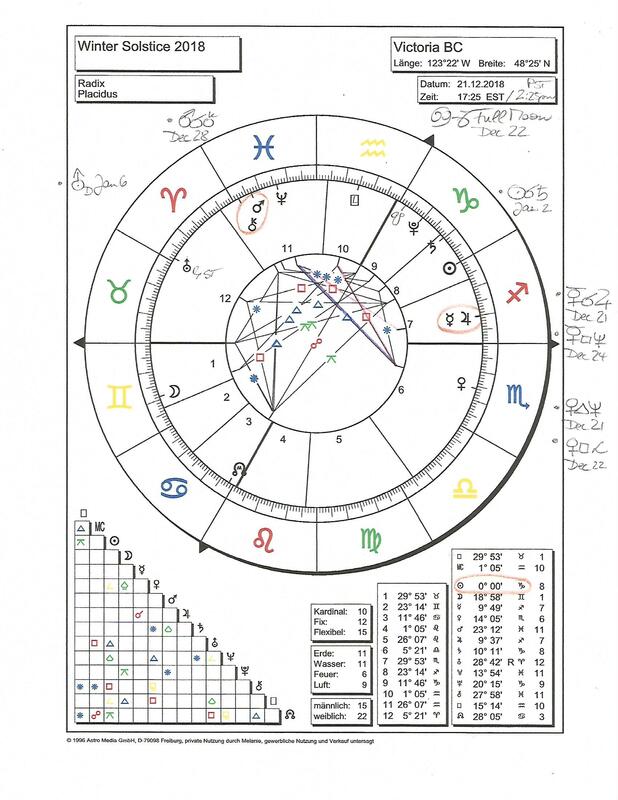 Please find its ‘birth chart’ below. The transition from LI to SCO is a ‘Tipping Point’ energy (the scales tip, and choices lead to change) and also an ‘Alchemy Point’ (‘ingredients’ of experiences may come together, and encounters with people may deeply touch us, and have transformational effects on us). Falling in Love, Falling into Fall, Dying to the old Self and immersing into the Change…. What’s the MAGIC and ALCHEMY you’re stepping, falling, or diving into, these extreme and emotionally intense times? While deep inside (or barely under the surface) the authentic YOU is SO ready to be born / reborn (URANUS in ARIES) and LIVE. What would ‘tip the scales’ of choices for you? What’s the paradigm shift that’s about to happen now, or has already happened for you, that sets you FREE? Maybe you’re done with inner relationship contracts (a LIBRAN thing) with self absorbed, overly dramatic, narcissistic, toxic (you name it) people in your life (in personal relationships, and ‘even’ with famous people ‘out there’ in public). Don’t blame them and self-victimize, can’t change them. What do they mirror you? We have to change from within. Themes around change are so BIG, and there are so many opportunities now – MERCURY / JUPITER both now in SCO. See ‘Taboo Talk’ blog post from Oct 17. Sometimes, the issues have to get big (JUPITER) to change (SCO). Perhaps a theme of the whole JUPITER-in-SCO year (Oct 10, 2017 – Nov 9, 2018). Through our deep inner change (SCO), the World we perceive (JU) changes. Disclaimer: This is not a call for a rose coloured spiritual bypassing, rather for a deeper immersion, and intimacy with Life that might appear scary at first. This NEW MOON in LIBRA is in a sense like a FULL MOON, because of its polarity with URANUS in ARIES. Liberating ‘Golden Boy’ Prometheus at the Rockefeller Centre NYC, surrounded by the Zodiac belt. Prometheus the Awakener is the Archetype related to the Planet Uranus! Lots of tension, polarization, upset, tragedy and turmoil is going on these days (I don’t need to tell you, it’s everywhere…). Scary and unsettling indeed, yet it’s also deeply moving time that brings us fully into the moment (ARIES). The internet wasn’t working yesterday and today – made me once again realize how dependent we all are on the umbilical cable / wireless connection. And I couldn’t get to the blog either for that matter. After a few diy attempts, calls to my internet company, a phase of being really nervous, since one technician said it’s an issue with my computer, and asked whether it’s still on warranty!, mutual Scorpionic detective work with a competent technician lady (didn’t give up, called again – LIBRA kicked in: finding a good ‘match’ in her), in the end, re-setting the router did the job. Ok, URANUS definitely brought me into the acuteness of the moment here. So yeah, thank you for your patience with the AstroNews delivery!!! 2011, 2013, 2015, and 2017 – today – wow! The whole URANUS in ARIES phase since 2011 has been a series of wake-up calls (URANUS entered into ARIES on the day when the Fukushima catastrophy happened), and a mass Awakening of Humanity, politically / societally, and spiritually. When URANUS goes into relationship with a New MOON in LIBRA peace, balance, and harmony can be quite disrupted and even shattered. On another level, True Freedom, Awakening and Liberation is ripe to be brought into the realm of relatedness – which would show up in areas of life related to the LI – AR axis in your chart. What’s Freedom that has no opposite? Only this is true Freedom. What’s Love that has no opposite? Only this is true Love. Deep, simple, radical truth pointers (a la SATURN now coming to the ‘Galactic Centre’ end phase of SAG…) that have stayed with me, and that I’ve shared with friends and clients. With this in mind and heart, it’s not about a path of holding the balance between opposites of Freedom (URANUS in ARIES) and Relatedness (LIBRA) but the (pathless) point is to BE FREE, unconditionally, authentically, anywhere, everywhere. And this could be a radical (URANUS) seed point (New MOON / ARIES) NOW. Let’s take a look at the LIBRA NEW MOON chart! The New Moon was today Oct 19 at 12:12 pm PDT. What a striking gathering of SUN / MOON late LIBRA, next to JUPITER / MERCURY in early SCORPIO! All four celestial bodies are wrapped around the ‘Alchemy Point’, from Earth perspective. Right opposite (for the SUN and MOON exactly, today!) URANUS retro in late ARIES! Perhaps also a reflection of the volatile scenario of a few crazy people playing with Uranium these days, while the scales may finally tip towards peaceful coexistence! On the other hand, a wake-up call to be fully alive in THIS, experience the Magic and Alchemy of every moment, and drop into the Intimacy with Life. The MOON will enter SCO (in her monthly cycle) today Oct 19 at 6:41 pm PDT – 6 hrs after the New Moon, and we might drop emotionally into intensely moving, cathartic processes. The SUN will seasonably move into SCO on SUN-day Oct 22 at 10:27 pm PDT, for a month of bringing consciousness to change from within, and new empowerment from there. There’s a huge transformational boost round Oct 26, when the SUN meets mighty JUPITER in SCO (only once a year), and it’s also the day of the encounter of the CAP MOON with PLUTO – the ruler of SCO, pointing to emotional processing of old conditioning, and awareness of what’s been hidden, so that it may change for the better. VENUS will join SCO on Nov 7 (until Dec 1), ‘exiled’ from ‘her’ Taurean domain. We’re drawn to look under the surface of things, and discover hidden beauty in the dark and changeful. Don’t get too absorbed in a ‘magical black hole’, too many vampire movies, crime scenes, and personal power games though, as VENUS will go into conjunction with JUPITER on Nov 13, and into trine with NEPTUNE in PISCES on Nov 16. Rather channel the energy into deep immersion in the mystery of Life. Lastly, MARS will go into SCO on Dec 9, when all the other archetypal players except JUPITER will have left SCO. MARS will connect with JUPITER on Jan 7, 2018 – the last connection of a planet with JUPITER in SCO (until Oct / Nov 2018). New year’s purge? Definitely a lot of energy is available. The Mutable T-square from MARS in late VIRGO (will move out of the alignment, and into LIBRA on Oct 22), opposite CHIRON retro in late PISCES, both square SATURN / LILITH in late SAG – the Galactic Centre! A challenge / stress dynamic that needs an outlet at the late SAG apex. Maybe you’ve felt overwhelmed, helpless, and disconnected – CHIRON in PI – (I did, literally, from the Internet…), and needed realignment ‘surgery’ and assertion of your integrity (MARS in VIR). Connecting, asking for help, and doing spiritual practice with subtle energy brings things into flow again. When in a ‘rien ne va plus’ mode, it’s important to follow natural inner guidance (SATURN / LILITH in SAG) that knows… even if you don’t see the light. LILITH and SATURN in late SAG connect in auspicious trine with URANUS retro in late ARIES (was for LILITH already exact on Oct 12 – see: me too ‘explosion’, will be for SATURN on Nov 11). Trusting intuition, trying a completely new approach, re-set and re-start, seeing things from a fresh angle, and being fully present with what’s in front of you, step by step is the way to go. MARS will enter LIBRA on Oct 22 (until Dec 9) – Pursuit of Balance…? On the same day (Oct 22) the SUN crosses over the Alchemy Point, and enters SCO. Stay tuned for the next AstroNews Blog post! I’m always happy to welcome you as a client who is not seeking a ‘reading’ from me (“What’s going to happen TO me?”, “What am I supposed to do?”), but to be supported in accessing your own wisdom source, especially in times of a challenging transitions, stuckness, transformational crisis, for perspective at a crossroad or dilemma, and for empowered choices. ARIES – LIBRA Harvest Moon 2017: Wake Up, Be Fully YOU, and Bring Your Authentic Nature into Cooperation and Partnership! The ARIES MOON is here-now, since 1:40 pm PDT today Oct 4 – opening the scene for her exact Fullness, opposite the LIBRA SUN, tomorrow, Oct 5 at 11:40 am PDT. The warm and golden early October SUN and the crispy-fresh moonlit nights this week have been such a beautiful gift of contrast and balance. 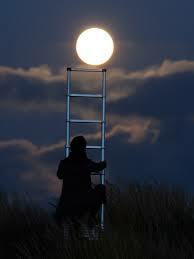 The first Full Moon in Fall is coming up! It’s the Harvest Moon – the Full Moon closest to the Fall Equinox! A good time to check in, what’s coming to Fruition, in this Harvest time – not just from the Summer, but from longer phases! Soo much has been stirred up and in turmoil in the social and public world, and for many of us privately too in the last weeks, as URANUS the Shake-up / Wake-up Liberator yet also disruptive, shocking, and traumatizing force turned direct / forward at the very end of ARIES, in early August. How have you set yourself FREE from being bombarded with news that could easily re-traumatize something latent in you? What do you DO about moving courageously forward in your life and in this world? What’s waking up in you? MARS, the ruler of ARIES, has been travelling close to the SUN this Summer which heated up the atmosphere, and it’s been sadly literally a record year for out-of-control wildfires here in the West. Hope you found positive passionate outlets for MARS / SUN this Summer! The SUN is gradually further ahead of MARS now, loosening the heated Yang type combo, plus, the present LIBRA SUN is ruled by VENUS, and more conducive to the dance and negotiation in partnership than than battling with fire and fury. Additionally, up until tomorrow, Oct 5, MARS has been ahead of VENUS (since Spring 2016! ), and we’ve seen the effects of a MARS driven world all too well. This too is changing, as VENUS will pass MARS, just hours before the Full Moon. Please find my VENUS / MARS blog post here, for more in-depth info (incl. the Sabian Symbol for their union). What’s cooking for you, in the Conscious Cooperation Caravan? Also JUPITER is coming to the end of its 11-month journey through LIBRA next week, on Oct 10, when it moves over the ‘Tipping Point’ into SCORPIO (until Nov 9, 2018). What have you seen more clearly about relationships with significant others and yourself IN relatedness, over the last year? What did you attract in others as a reflection of yourself (missing parts, blind spots, shadow projection)? Which important choices came up for you, and how did you go about choosing wisely? How do you go about restoring inner and outer peace and balance, in a world of turmoil (JUPITER in LI has been opposed by URANUS in ARIES 3 times, in Dec 2016, March and Sept 2017)? The area of life related to LIBRA in your chart is what has been ‘blown up’ so that there can be more space around it that allows for (mutual) growth. ‘Even’ good ole SATURN comes to the end of the SAG finish line soon – on Dec 19 – where it’s been since Sept 2015, challenging us to focus on the light and on what matters, in a world of distraction and disorientation. How do you stay on track on your intrinsic path? When challenges and ‘obstacles’ show up, can you recognize them for what they are, adjust the course or our approach, and take the teaching and guidance? What keeps you moving forward with your vision? Where’s your WHY? Where does the journey go NOW, and what motivated you now, compared to 2 years ago? We’re in the build-up time for this ARIES Full Moon that’s a ‘fierce midwife to URANUS’, the Awakener and Revolutionary Archetype. When the BS hits the fan there’s no holding back – so much is bursting out now, as in ARIES – emergence / emergency. Quite the wake-up call, for The Feminine (MOON) and for The People. In traditional Astrology, the MOON is the Archetype of the People vs. the SUN is the King / Queen / Ruler. I know, this societal model is outdated, and up for evolutionary change, but hey, it’s been symbolically still in effect, and currently again in full force, as seen in places like Catalunya striving for its independence from Spain (see yesterday’s Astro blog about it, with the charts of Barcelona and Spain). Speaking one’s Truth, and being on the Path is very ‘loaded’ now. The Full Moon will be in the central LEO part of ARIES, and URANUS is in the Sagittarian part of ARIES – linking over in a trine to SATURN in SAG – the end of ‘old stories and beliefs’. What stories are wanna-be leaders trying to tell us? We’re not living by ‘old stories and dogmatic laws and beliefs anymore. The Inner Revolution and Liberation has begun for so many of us, in fact, is HERE when we wake up from the past, from the dream, from anything that keeps us from living in the NOW. Since the ARIES FULL MOON is close to URANUS (and will meet URANUS on Oct 6, the door to spiritual awakening is open. Upon waking up (“What a crazy nightmare was that?? ?” or “Was I dull, not really alive, apathetic, and paralyzed?”), a freedom FOR a conscious new start, a new blossoming, and / or: An alert presence in the I AM can ‘take over’. What’s LIBRA got to do with it? What would be conscious (SUN) choices (LIBRA) that meet the need (MOON) to be authentically, fully YOU (ARIES)? Hint – it starts with: Choose Yourself! What’s negotiable (LIBRA) and what’s a deal breaker (URANUS in ARIES)? How could a partnership look like (LIBRA) that brings out the partners’ liberated beingness (URANUS in ARIES) where the light is reflected to one another? Baby steps at a time (ARIES) are fine and normal. Too much sitting on the fence, weighing and waiting (for the other to make a move, for ‘something’ to happen and tip the scale) doesn’t do it much longer. JUPITER ‘had it’ and crosses over the ‘Tipping Point’ into SCO on Oct 10. Choices create change! Lots of questions to consider, says SUN / MERCURY, not far from JUPITER in LIBRA, on the other side of the ‘equation’. Yet, i.m.o., being truly, spontaneously authentic in the Self naturally supports good choices, and things don’t ‘stick’ so much in relationships that need to be ‘ironed out’ again. I know, it can be a balancing act to bring one’s true authentic Nature into relationship – but it’s actually more from the perspective of the conditioned Self an ‘issue’ than from the free, authentic Self. On the DAY of the ARIES (ruled by MARS) – LIBRA (ruled by VENUS) Full Moon will be also the union (every 2 years only) of VENUS and MARS (see today’s blog post for this theme)! May cooperation (VENUS) rather than competition and confrontation (MARS) lead the way now! May the world, humanity, and everyone of us be more / come back into integrity (VIR), and may right relationship/s in dynamic, ‘juicy’ synergy help us with conscious, creative cooperation! Specifics and ‘details’ can make things complicated and create conflict and stagnation – or just need to be ‘ironed out’ to open the path for the YES. Integrity in adaptive Fluidity can be the Medicine. You see the Full Moon Axis of the MOON in mid-ARIES (with LEO undertone – Be Fully and authentically YOU!) not far from URANUS end of ARIES which is in mutually enhancing Fire trine with SATURN / LILITH in late SAG. LILITH is now in the area pointing to the Galactic Centre where we deeply trust the ultimately Unknown – to reveal our True Nature in the ‘Journey’. How can we consciously cooperate for Peace, Justice, Fairness, Equality? It takes a team / group / circle / humanity. 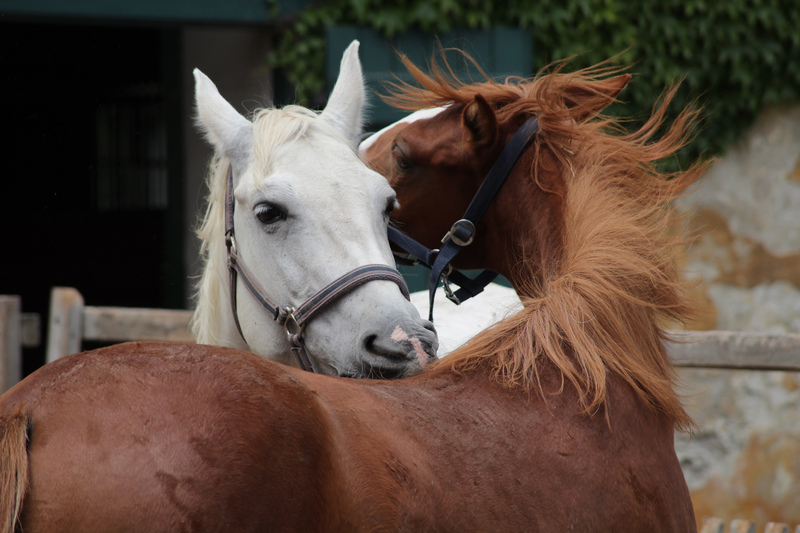 What’s a well-suited cooperation and partnership – esp. with others who show up in the area of life where LIBRA is in your chart? If they aren’t naturally compatible how can you bring yourself into balance and be at peace with what IS? MERCURY will go into opposition with URANUS on Oct 15, and the SUN on Oct 19 (the day of the LIBRA New Moon) which can be quite a dilemma between ‘Us’ and ‘Me’ or convention and spontaneous action. It can also resolve the tension from JUPITER opp. URANUS since last Winter. May there be a consciously chosen win-win! PLUTO, still stationary (went direct on Sept 29) in mid-CAP is the apex (= outlet) of a wide cardinal T-square with the Full Moon axis! How do we know when’s the ‘right & ripe time’, esp. when making choices that involve / are dependent on others (LIBRA) while you might want to move forward or it’s not really your gig (ARIES)? Astrology helps through showing us the cosmic cycles, and how to align with them. Natural inner knowing and alignment helps too. Don’t let yourself get guilt-tripped (“You should do this for… them”) or pressured (“You should be already…. doing this”) in this ever so 24/7 production mode world (which isn’t really all that productive, if natural cycles of rest and regeneration aren’t honoured. So perhaps the Power of TIME means to slow down, smell the Roses, and let things naturally ripen until their Harvest time comes…? Being in (LIBRA) partnership with them, and guided (CAP) by and to them can be very powerful – IF you hear the call (SATURN, the ruler of CAP is now in SAG, testing us to find where the most important YES is). Working respectfully with the cycles of nature, incl. our own nature, the human life cycle, and day-to-day cycles. CAP traditionally works with the Land, and cooperates with Nature. When and where is a good time / place to seed / plant / harvest? The shadow would be to abuse, over-use, and the lack would be to under-use what’s sitting somewhere, and would be a helpful resource. Bottom line: Time for an inventory (LIBRA / CAP) / invent-ory (URANUS in ARIES). The most obvious ‘earthly’ resource ‘close to us’ is our body, of course. Mid-CAP where PLUTO is now has also a TAURUS undertone – TAU rules bodily sensation. So yeah, let’s definitely bring the wisdom of the body in, for wise choices, and empowering change, while being in our authentic Self! JUPITER, on the brink of leaving LIBRA, will enter SCORPIO on Oct 10, to move through the Magical Zodiac zone until Nov 9, 2018. The painting to the left by Johfra Bosschart contains a lot of esoteric symbolism. In the Egyptian Book of the Dead, Ibis-headed Thoth to the left with the double-serpent and Cow-headed Hathor to the right weigh the heart of the deceased (in an urn) against the feather of Ma’at (Goddess of Justice). 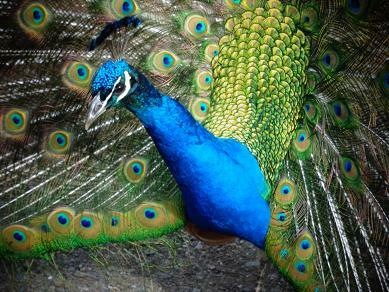 May in any significant choice point and transition our heart be unburdened, and as light as a feather! The transition from LIBRA to SCORPIO is not only the ‘Tipping Point’ (the scales tip, the choice is being made – or it’s a ‘choiceless choice’! – and inevitably leads to change), but also an ‘Alchemy Point’ where ‘ingredients’ are ‘married’, to co-create something bigger than the sum of them. If the ‘match’ is magical powerful change is afoot! JUPITER into SCORPIO shows us opportunities to go into magical change – if we trust the Unknown. Yet it also shows what’s hidden and covered, and makes it worthwhile visiting and digging deeply into our taboo, repressed, or emotionally (apparently) controlled experiences. To bring forth treasures that we might have buried from the world and ourselves. Who knows what comes from that?! More to come, in a special JUPITER into SCORPIO blog post next week. Guru Purnima Full Moon Blessings – with the Astro ‘Gurus’ Jupiter & Saturn! There’s a lot to the upcoming CAP – CAN Full Moon – exact on Saturday July 8 at 9:07 pm PDT! Yet, it can be summed up in simple ways (CAP likes that!) – Guru Purnima leads the way! The Full Moon comes with Sirius the ‘Dog Star’ / Scorcher (which is presently at 14°19′ CAN), next to the SUN / MARS, and with Vega the ‘Harp Star’ (which is presently at 15°34′ CAP), next to the MOON / PLUTO. Two major Fixed Stars – with beautiful yet also dramatic ‘star love lore’ are involved in the already Full Moon ‘Power House’. And: the Full Moon axis is squared by super-charger JUPITER. Here is the Sirius / Vega enhanced Full Moon Chart – whoaaa! Here on the West Coast, the Full Moon will be exact at Moonrise / Sunset! Clearly, this Full Moon gets our attention, and has us process lots of inner, old, ancestral, ancient ‘stuff’ (PLUTO next to the MOON in CAP). And it’ll be also in the centre of CAN – CAP (which has a ‘fixed’ SCO – TAU ‘undertone’ – the ‘axis of the Buddha’. A friend sent me a Ram Das article today – so synchronistic. What’s our job when people ‘are difficult’? How do our emotions and needs (like for them to love and appreciate us) have power over us, pull you into the drama and out of equanimity? What needs to deepen to change this? A heavy curriculum… (a la CAP)… yet lightened and transformed in the Heart. In Hindu and Buddhist tradition the Full Moon in July is the Guru Purnima / Guru Puja, dedicated to the inner and outer Guru. Ganesh is being invoked at the onset of a journey. Dense stuff, perhaps. Heavy curriculum? May the Inner Teacher and light bringer show the way! GU-RU means ‘simply’ “From Darkness to Light” – one who removes darkness and brings light. “Guru Purnima is celebrated on the day of the year when the Sun is closest to the Earth and the Full Moon reflects the brightest light. It is a holy day, and an especially beneficial time to make fresh resolves for spiritual growth. Because the energies of the Sun and Moon are both at their peak, our subtle energy channels are unusually open and receptive to absorb spiritual energy. Practices done or begun on this day will bring growth and auspiciousness in the life of the disciple. Through sadhana (spiritual practice) and by following the Guru’s teachings, devotees can purify the mind to reflect the Atman, just as the Moon reflects the brightness of the Sun. Never too early, never too late, for spiritual practice, and connection with the inner guru / teacher / mentor / light bringer, I’d say. Time (ruled by CAP) in fact can be suspended, stretched, and can dissolve and ‘disappear’ in immersion with what IS (PLUTO points us to ‘that’). The guru is a bridge into vastness, spaciousness, and freedom. In Astrology, the ‘Guru’ is associated with the Archetypes of JUPITER, the mentor, and SATURN, the teacher. What ‘kicks us out of balance’ (esp. in relationships with loved ones and not-so-loved ones)? What’s the emotional charge – CAN – and what’s the need for acknowledgment, control that turns into judgment – CAP – ? What brings us into inner Peace, regardless? How about developing a good relationship (LIBRA) with spiritual practice? Once we SEE the benefits (JUPITER) it’s clearly a wise choice (LI). SATURN is also very potent at this Guru Puja time, since it is now almost stationary (during August), and will go from retro (since Apr 6) to direct / forward on Aug 25. As we step out of the ‘path’ of limiting Karma and ‘Obstacles’, we SEE more clearly, and move forward with transformed understanding and strength. Under PLUTO in SATURN ruled CAP (2008 – 2023), and NEPTUNE & CHIRON in PISCES (since 2011 / 2012, until 2018 / 2026) so many traditional spiritual teachings and practices have massively reached the Western, modern cultures and become ‘mainstream’. Different accesses and avenues for everyone, yet light is always light. The Light in me honours the Light in you!